There are certain binomial multiplications that appear over and over again in problems and on tests. If you can remember the patterns, you will be able to quickly arrive at these products and save yourself some work. But don't worry! If you cannot remember these patterns, you can always multiply the binomials to arrive at the answer. In each pattern, the middle term is twice the multiplication of the terms used to create the binomial expression. Notice how the sign of the middle term is positive in (a + b)², and negative in (a - b)². 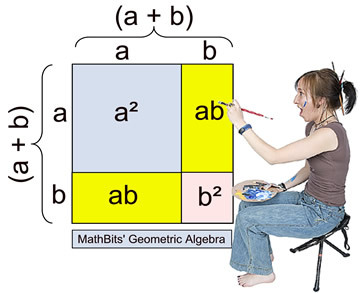 Take a look at the picture at the right showing a geometric display of the square of binomial (a + b). The picture shows a large square whose sides have a length of (a + b). Inside this square are two smaller squares and two congruent rectangles. You can see in the picture how the middle term in the pattern becomes twice the product of the terms from the binomial [2(ab) = 2ab]. The area of the large outer square equals the sum of its interior components: (a + b)(a + b) = a² + 2ab + b². Squaring a binomial creates a perfect square trinomial. A perfect square is created when a value is multiplied times itself [such as 5 x 5 = 25, making 25 a perfect square]. 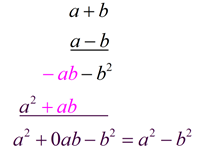 Thus, (a + b)(a + b) = a² + 2ab + b², making the trinomial a² + 2ab + b² a perfect square. Notice the center term = twice [x • 4], or 2(4x) = 8x. Notice the center term = twice [2x•(-3)] = -12x. While there appears to be "no" middle term in this pattern to form a trinomial, the truth is that the coefficient of the middle term is zero, and is therefore not written. You will want to remember this pattern which creates a zero coefficient on the middle trinomial term. It will prove most helpful when factoring and solving other types of problems. Notice the center term has a coefficient of 0. The last set of patterns relates to cubing binomials. Remember that "cubing" is the process of raising a value to the power of 3. It means to multiply a value times itself three times, such as 123 = 12 • 12 • 12. To cube a binomial, multiply it times itself three times. This will require a two step process. STEP 1: Multiply the first two factors. STEP 2: Multiply your answer by the third factor. Multiply the first two factors. Multiply STEP 1 by the third factor. 1. There are 4 terms in the pattern. 2. The exponents of a decrease in each term, while the exponents of b increase in each term. 3. The middle terms contain a factor of 3. The pattern is similar to CASE 1, but the signs of the second and fourth terms are negative. Remember: if you forget the patterns, just multiply the three factors to get the answer. Algebra 2 method with pattern.